I won’t deny it. I love it when people comment on blog posts that I publish. It shows me that people care about what I write about. It also proves that my many hours spent researching, writing and editing content were not made in vain, and have an impact over readers. If you’re a blogger, feedback and appreciation of your published work is important to maintain your motivation to write your next piece. This user feedback usually comes in one of two forms: social shares (FB likes & shares, tweets, pins, etc.) and comments. The problem is that WordPress’s default comment system is far from being perfect, to say the least. While some bloggers and site owners still use it, many use plugins to enhance or repljetpackace it. In this article I’d like to find out once and for all which is the best comment platform for WordPress, analyzing all the different features, pros and cons. I am going to compare 3 of the most popular comments platforms: the default WordPress comments, Jetpack comments and Disqus. I will not rest until I am certain that I have found the best comment platform, according to the standards I deem important. The most important comment feature, for me at least, is the ease at which users can comment on my posts. When users feel it easy to leave comments, they are more likely to leave a comment afterwards. I want my users to feel a natural flow from reading to commenting, like there is no hassle involved. This means shortening any barriers the user might come across for submitting comments, like captchas or a tiring registration process. WordPress. WordPress comments fail miserably when it comes to ease of commenting. In the default settings, users have to enter their name, email, website and message. Of course you can customize and change these fields with coding, but that is irrelevant. I am only critiquing features that work out of the box with no tinkering needed. Jetpack. Jetpack improves the ease of commenting on WordPress. It allows users to register via their user profile on Google, Facebook, Twitter or WordPress.com. It also hides all the fields from the comment section so the user first only sees the comment field, and is drawn to fill in the details after leaving the comment. Disqus. This plugin does the same trick as Jetpack to promote visitor commenting, hiding all fields except the message until the user clicks in. Disqus has a better UI, and for example, enables the user to log in from the right side, or sign up on the bottom. Your day to day comment moderation can be a real hassle. This is why I prefer Disqus’s settings, that approve the comment automatically. WordPress. The default for this platform is to approve every comment. There is no email verification, so you are much more likely to get spammed. WordPress has the option to automatically approve comments by registered users or by users with previously approved comments. This is a huge feature that makes creating and managing a community much easier. Jetpack. Here comments need to be approved, same as for the default WordPress comments. Disqus. Email is verified, and comments are by default approved. You can change these settings to require approval of every comment. I hate getting spam comments. The best spammers know how to create spam that seems genuine. This makes moderation really hard, because you actually perceive the spam as a genuine comment, complimenting your blog. Trust me, it’s very disappointing to get an ego boost from reading a flattering comment, only to find out it is generic and spam. WordPress. The basic WordPress comment platform doesn’t have built in spam filtering, and even though Akismet comes with the basic installation of WordPress, it’s still a bummer to install a plugin just to get this basic filtering option. What is even more aggravating is that Akismet doesn’t manage to stop all the spam comments, so you still get bombarded with spammers. WordPress spammers are also more encouraged on the WordPress default comments because they get a link back to their site for their comment. Even though this is a nofollow comment, they still perceive it as valuable, if only to get traffic direction. Jetpack. Jetpack doesn’t add new spam filtering options to the default comments system. Disqus. According to their help guide, “Disqus uses its own anti-spam software to smartly combat comment spam”. I found Disqus’s spam filter much better than Aksimet’s, because even after weeks of using it I stopped receiving the spam messages I used to get. Chances are you will first find out about a new comment by the email you’ll get. It’s a real hassle to go from your email message to the admin, type the password and finally approve the comment. This is especially uncomfortable if you are using your mobile device. 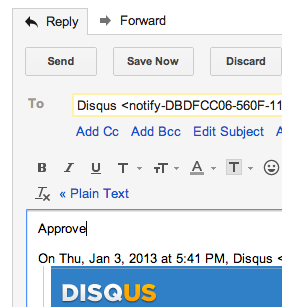 This is why I found Disqus’s email comment approval so handy. WordPress. To approve a comment, you have to login to the website admin. Disqus. Disqus lets you approve comments from the email itself, by replying Approve, Delete, or Spam to the notification email you get. This is immensely useful! Especially when you need to moderate from your phone. You can also reply to comments from the email itself. Having a great comment system design is important for two reasons: To maintain a great site design, and to encourage users to comment. WordPress. This system is ugly but customizable. The default WordPress comment system comes with a very basic design, that usually automatically changes to fit the theme you are using. Jetpack. Better looking, yet less compatible. You can change the design from light, dark or transparent, and add a customized headline before the comment form. The downside of this is that some of the themes might override Jetpack’s design settings, and there might also be some conflicts with some of the themes. Chances are the theme creators did not customize their theme to fit Jetpack comments, as opposed to WordPress’s default comments. Disqus. Best looking, but hard to customize. I really like the default design of Disqus. I think it’s cleaner and more esthetic than WordPress and Jetpack’s. The problem is that it might not fit your theme very well. Winner: Disqus for the default and out of the box design, WordPress for the customizable design. Some users don’t want to log in with Facebook, or enter their email. They want to simply comment, without doing any logging in. WordPress. With WordPress, it’s very easy to enable these users to comment. Jetpack. Works the same as WordPress. Disqus. Guest posting is not the default of Disqus, and even after enabling it, users still have to enter a name and email, so it’s not really anonymous. Website performance is an important matter. If you’ve invested in on-page optimization, you don’t want your commenting system to slow you down. It’s hard to measure the exact impact of the comment system, as it can be affected by the number of comments. You can check out Matt Gadient‘s review, comparing exact speeds of Disqus in comparison to the default WordPress comments. WordPress. 1.19s Load time. The fastest loading comment system. Jetpack. 1.66s Load time. Almost as fast as the default. Disqus. 3.79s Load time. Tends to have a slow load. In order to increase Disqus’s speed, you can use the Disqus Conditional Load plugin, that has features like lazy load. There is a concern for SEO regarding Disqus, because the comments are saved on the Disqus servers. However, as mentioned in this moz discussion, Disqus is also saved on the WordPress database, and is indexable by Google and other search engines. We included this criterion only to set people’s minds at ease, but all three plugins perform relatively the same as regards to SEO. It makes sense, especially if you get a lot of comments, to use the rating of your readers to sort comments, putting the most liked comments on top. WordPress. The only option you get with WordPress comments is to show the most recent comments on top, or the other way around. Disqus. This plugin has built in rating and sorting options. Users can upvote or downvote comments, and also sort comments by most recent, oldest or most upvoted comments. Sorting options are set by the user, whereas with WordPress and Jetpack sorting is made by the admin. Before I first installed Disqus, When I first started commenting on the Disqus platform on other blogs, I noticed that as a user, my commenting experience was different than in other platforms. Instead of commenting and forgetting about it, at most getting notified via email when I got a reply on my comment, I suddenly had a single platform that accumulated all the comments I did across the Disqus network. This seemed amazing to me, and made me feel like I was part of a real community. As a marketer, I am always trying to connect to the community of users I am marketing to. Disqus does exactly this. Different blogs are seen under the same platform. WordPress. No community at all. Jetpack. Jetpack allows a sort of connection through WordPress.com. Users can log in through their WordPress.com user. This is not integrated enough into the comment platform to make a real sense of community. Disqus. Great way to develop a sense of community for your blog audience. Disqus, though being completely free, does have a major setback. Its default setting includes the appearance of ads that come from Disqus’s native advertising system called Reveal. You can opt out of Reveal if you have a personal or not-for-profit site. Disqus. Includes a native advertising system called Reveal. Disqus has many advantages over WordPress and Jetpack. No wonder it is used for sites like Canva and Sitepoint. The major cons for Disqus are the ads that appear on commercial sites, and the limited design customization options. 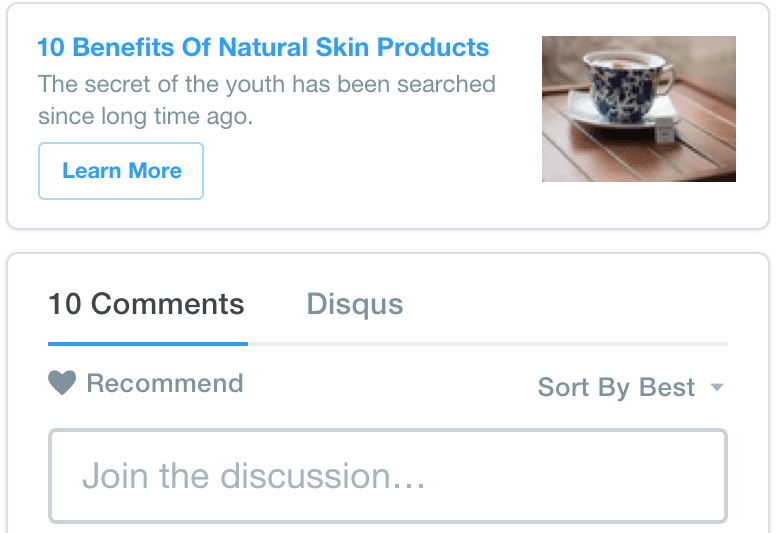 The bottom line is that Disqus gives you a wide array of advantages when it comes to comment options, it’s free, and it also develops the sense of community between your blog and other blogs in your field. If many people read your blog, but you get almost no comments, I recommend using Disqus and seeing if comments start pouring in. We have used Disqus in the past but moved away from it for a couple of reasons. One reason was privacy issues – much better to retain your visitor info than offload it. The biggest one was speed issues though. On posts with lots of comments Disqus was tripling or quadrupling the page load time. No commenting system is worth that. Now we use native commenting together with Postmatic and Epoch. I really believe that gives the beat WP commenting solution out there right now. Disqus, though being totally totally free, does have a significant drawback. Its standard establishing contains the overall look of ads that come from Disqus’s local marketing program known as Expose. You can opt out of Expose if you have a individual or not-for-profit website. Here’s what I’m trying to figure out. Setting aside the speed issues (which may be a deal breaker for me anyways), when I go to many sites using Disqus, like smart passive income and canva, etc. I don’t see any ads. I believe I have turned off all my ad blockers. Assuming I have, why don’t I see ads on those sites? Surely they don’t all qualify as individual or non-profit, do they? I actually don’t have an answer to this, and I’ll love to find out. Maybe it’s a specific type of connections between these brands and Dysqus. thinking of changing my comment system right now. i use wordpress comment system, but it just feel ugly when there is to much comment. maybe i’ll try discuss next.. i don’t know..
thanks for the comparison thought..
My favorite is jetpack. I set approval comment, and restrict comment on an article which is published more than 90 days. I really like the title of your blog it’s really catchy. 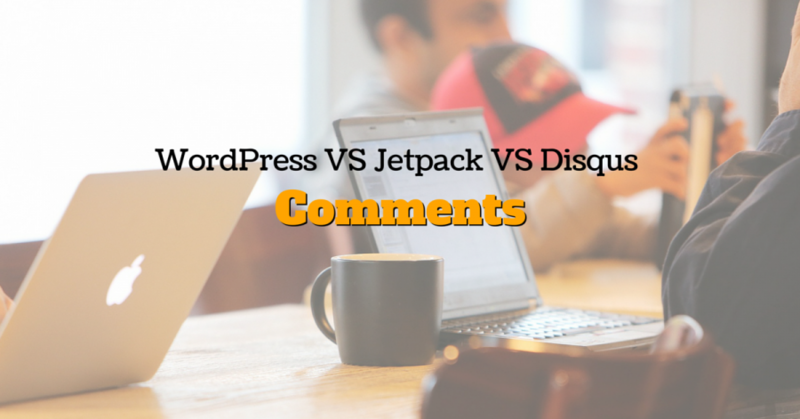 In the war amongst the Disqus, Jetpack and WordPress comment. I like the Disqus most. so why aren’t you using disqus on this site ? isn’t it the winner of the commenting systems ? there must be other things that made you not use it here.. what are they ? The truth is we don’t have time to do the switch to Disqus right now. Setting aside the speed issues (which may be a deal breaker for me anyways), when I go to many sites using Disqus, like smart passive income and canva, etc. I am considering which commenting system I should use. I’m not for Disqus, as I have seem plenty of blog owners moving away from it. So my shortlist would be either the standard wordpress commenting or social commenting like Jetpack. When people comment using Jetpack, and they use facebook for example, does comment get shared in their facebook account? If its does, it’s a major plus as there could be some social traffic this way. Disqus (as well as Facebook) is effectively a tracking tool eithr for selling “relevant” products to a person or in identifying a person as a malcontent/political discontent/subversive who needs to be kept under surveillance by the authorities so that after a sufficient number of postings not sufficiently supportive of the ruling administration have been made, they can then be sent to a re-education/societal-normalization camp. Thought crime is punishable and we must all strive to be prolific consumers (if you have not bought somethign today, your are being unpatrotic) and show our undying admiration and love for Big Brother Trump. – My former comment system which is blogger is a bit frustrating when large number of comments are coming, you have to scroll down until you reach the bottom for its comment box. very frustrating right. – My former comment system blogger, misleads other user searches because as we know comments are also indexed. off topic comments ruins the main content. 1. The ‘load more’ feature like in Disqus. 2. The comment box is in the top like Disqus. Just check the IAB ads only. It’s very important to take care of our blogs and let users comment wisely. I prefer to leave open and filter comments (maybe because I don’t have a big blog 🙂 ). You didn’t include the option of Disqus plus one other – leaving the choice up to the user. Of course it’s kind of ugly to have two choices, but I have seen it. Thanks for the useful information of WordPress-training-courses, give more innovative updates. Wow, very helpful article I am gonna change my comment plugin soon. Well written and easy to understand.